When I was young (like 7-11 young) one of the television shows that I recall my parents watching more consistently than any other was Little House on the Prairie. We watched many of the episodes on t.v. and then one year my grandmother (my dad's mom) went through the trouble of recording (via VHS) every episode that was on television that year, labeled all of the tapes with episode titles and presented my father with the box for Christmas. A very sweet, homemade, "Little House" type gift. As a child I have fond memories of watching the show with my parents, read several of the books and even owned a Little House on the Prairie journal (my very first come to think about it!). As an adult and now a parent myself I have a greater appreciation for why my parents loved that show so much-- the simplicity, the love, the strong morals of the Christian family, the sense and semblance of family and teamwork, and the hard working spirit and commitment to their values. Many of these very traits and values seem to have disappeared from current television listings (if they haven't disappeared they are VERY hard to find!) and popular young adult literature. So it was with pleasure that I just finished the book Life with Lily, the first book in a new series of young adult books being published by Revell (a division of Baker Publishing) by Mary Ann Kinsinger and Suzanne Woods Fisher. It is a book that reminded me, in many ways, of the Laura Ingalls stories. This particular book takes place on a small Amish farm in upstate New York where five year old Lily Lapp has a lot to do (or help her parents with) and a wonderful community of family and friends. But change comes quickly, a new baby brother, a new teacher at school, and new ways of looking at the world. Lily's days are full of helping with chores around the house, imaginatively making up games with her friends and siblings and taking care of her rag doll. 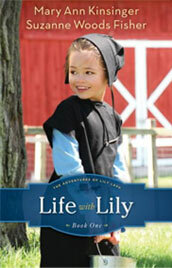 With chapter titles such as "A New Barn for Papa", "School Starts and Stops", "Lily's New Teacher", "Buggy in the Ditch", "Pumpkins" and "Christmas", the reader is taken through the day to day Amish life, as well as the seasonal changes and ways of celebrating, over the course of 18 months or so in young Lily's life. Kinsinger and Fisher are wonderful story tellers and provide well crafted details to help their readers "see" the story as they read along. While I found the story slow in the beginning (most likely because it differs from my typical reading preferences), I eventually found myself wanting to know what happened next in the curious little girl's life and looked forward to the next chapter. Also, as a mom with two small girls (5 and 3) I could easily see reading this book chapter by chapter to my own children and knowing they would enjoy the stories of friendship, birthday parties and horse drawn buggy rides. My 3 year old might be a little young (she doesn't sit still very well), but my 5 year old would definitely enjoy the stories It's a book that works as great bedtime material! It's also a great book for independent reading in the 8-12 age range. Overall, I think Life with Lily, Book One is a wonderful alternative to much of the post modern, edgy, young adult literature in the secular marketplace. It is clean, sweet, engaging and easy to read. It also provides a wonderful opportunity to teach our children about the Amish culture of and offers a number of segways into conversations about the differences between their lives and our own. For more information about the book, its authors and even details about Amish life you can visit the (very cute!) website www.AdventuresofLilyLapp.com. You can also order the book through Revell's website or, of course, Amazon. Hi Lisa! Just popping by to thank you for being a part of the "Lily" blog tour. Loved your review! In fact, I'd love to use one of your paragraph's for some promotion, if you don't mind. You write so well, Lisa. So grateful for your help to expose readers to this new series (and the website, too! ).